With more choice and information available than ever before, there has rarely been a better time to start a watch collection. For many people, it begins with a vague interest, perhaps sparked by the gift of a fine timepiece as a graduation present or a random impulse buy, and blossoms into a healthy obsession as they dig deeper into their particular brand’s story. Pretty soon that single model starts to look a little lonely all by itself, and then the search is on for the next piece to complement it. Before long, thoughts turn to actually dedicating time and money to a more serious collection. It is usually around this point the number of possible options presents itself, and the sheer scale of them can seem somewhat daunting. Where do you start? Do you stick with one manufacturer or go for several? Is it better to have one or two high end pieces or a larger number of lesser models? The list of possible questions appears endless, so in order to help as much as we can with what is obviously a personal and subjective choice, we have put together this short guide to the best way of starting a watch collection you can be proud of. Why Do You Want to Start a Watch Collection? This may sound like a strange question, but your reasons for starting a collection will obviously affect which particular type and make you buy. Do you want a watch for every occasion? One you can match with a business suit, another for t-shirt and jeans, yet another for your favorite sporting activity? 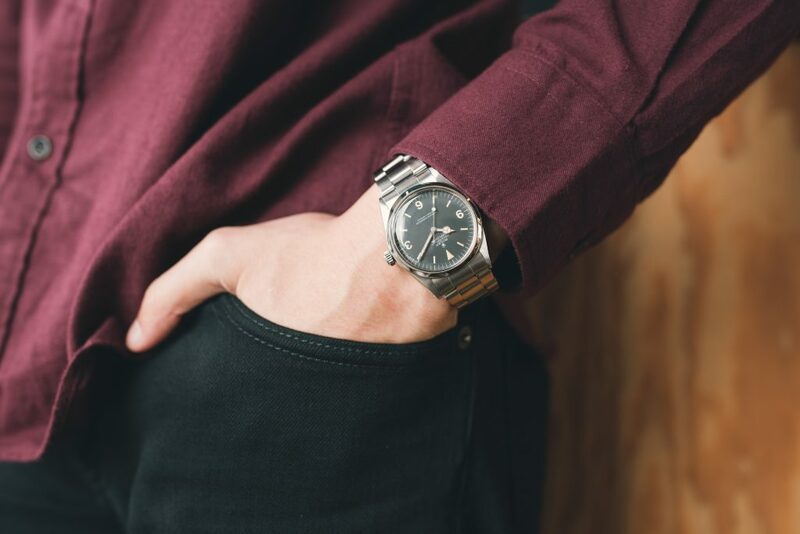 While there are certain models that can easily crossover all three without looking out of place, many collectors value being able to wear a specific watch for every aspect of their lives. 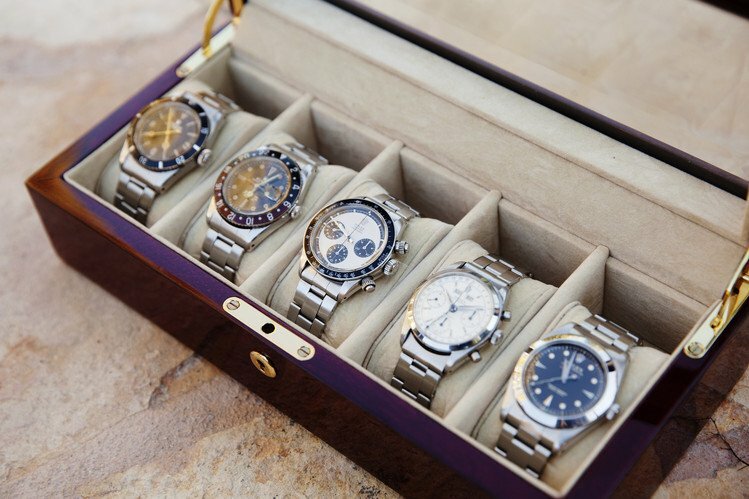 A collection of vintage Rolex watches owned by Paul Altieri, the founder and CEO of Bob’s Watches. Alternatively, maybe you have a fondness for a certain subcategory of watch. You might be all about divers, for instance, or are perhaps captivated by tourbillons. If so, your collection is going be less broad but much deeper, as you source the myriad different variations on your individual theme. You might also have a preferred brand, and want to collect most or even every one of the models they’ve brought out, or maybe you see your collection purely in terms of an investment, somewhere to park some money for the time being and wait for it to appreciate. Asking yourself the ‘why?’ question is a big time saver and a solid first step in building a great collection. Once you have identified your personal reasons for starting your new hobby, and even if you have narrowed the field slightly by opting to concentrate on a certain type or brand of watch, you are still going to be left with a massive selection to choose from. It can be, and often is, overwhelming. Only buy pieces you actually like. There is still a certain amount of snootiness surrounding watches and it is easy to fall into the trap of purchasing a particular model because you feel it is important, something you are ‘supposed’ to have, rather than it being one you enjoy. It is a lot like having a bookshelf stuffed with those titles everyone says you are ‘supposed’ to read but which have absolutely no appeal to you. Never forget, this is your collection and whatever you buy, there will be always those who praise or condemn you for it. Stick to those pieces that speak to you personally. Avoid following fashion. You can point to any stylistic trend in history to see the danger in spending significant amounts of money on ‘this year’s thing’. Fashions come and go with the wind, but a high quality luxury watch should last several lifetimes. Buying a model simply because it has captured the public’s imagination for a fleeting minute is a good way to land yourself with a tired and outdated collection very quickly. Designs that have stood the test of time will continue to do so, and seeking out those pieces with classic styling is the savvy collectors best option. Class, as they say, is permanent. Only buy what suits you. Going hand in hand with buying only what you like, it is important to stick to those pieces that also look good on you. Wearing something too small can leave people with the impression you’ve borrowed someone else’s watch. Similarly, huge, oversized models on a slender wrist can not only look fairly absurd, they can also be uncomfortable and, if you are matching it with formal wear, could well not fit under a shirt sleeve. 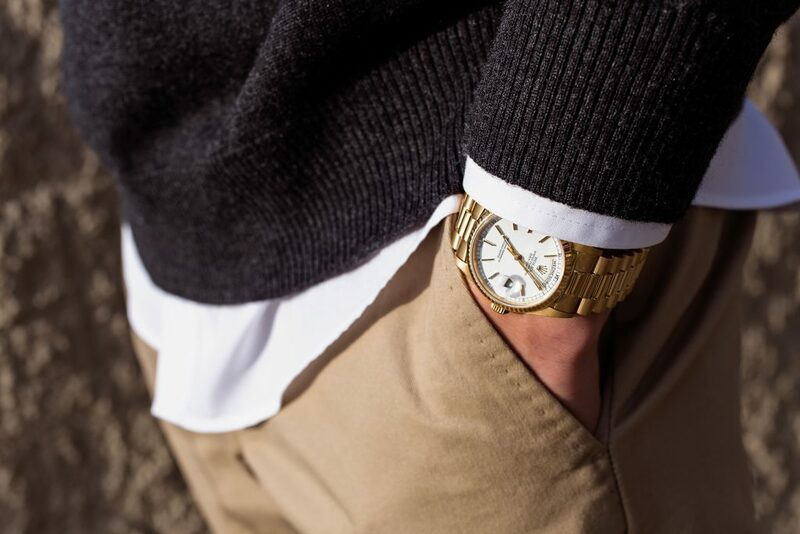 There are too many watches out there that suit you and your style perfectly to settle for ones that don’t. Don’t buy purely as an investment. It is certainly possible for watches to appreciate hugely in value, but only adding to a watch collection those pieces you hope will someday make you rich is a very risky game. Even worse, it takes a lot of the fun out of it. Investing in watches is the same as any other type of investing. There are absolutely no guarantees and it is likely to lose you money at some point. 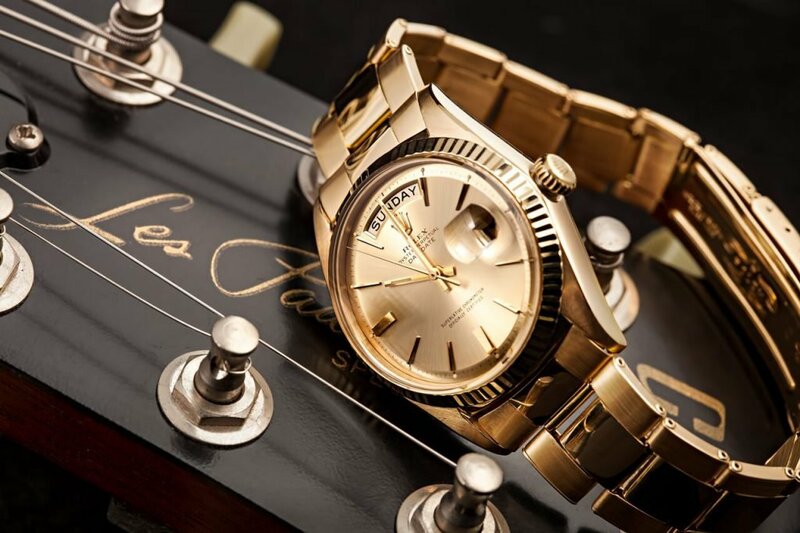 While certain brands perform better than others, Rolex and Patek Philippe usually heading the list, it is far better to keep your selection based around those timepieces you connect with on an emotional level rather than financial. Where the above are mere guidelines, this one is the closest thing watch collecting has to a set-in-stone rule. Conducting extensive research into the watch or the brand you are interested in is vital if you want to avoid making a costly mistake and landing yourself with the wrong piece. And perhaps even more importantly, studying just who you are buying from is not something to just take a gamble on. When buying luxury watches, especially vintage models, it is important to do your homework. There are obviously plenty of good guys in the industry, dealers who make it their business to help collectors secure the exact watch they want at a fair price. Regrettably, because of the big dollar values associated with the pre-owned market these days, there are also a fair share of bandits. Working out who to trust with your hard earned money should be near the top of your list as you set out on your journey. Fortunately, this is now easier than it’s ever been, with the slew of online resources at your fingertips. The various forums especially are an excellent font of knowledge and a perfect place to go for recommendations. Another reason why it is almost impossible to do too much research, is the rise in counterfeits. With recent advances in technology, fake watches are becoming harder and harder to identify, especially if bought online rather than in the flesh. 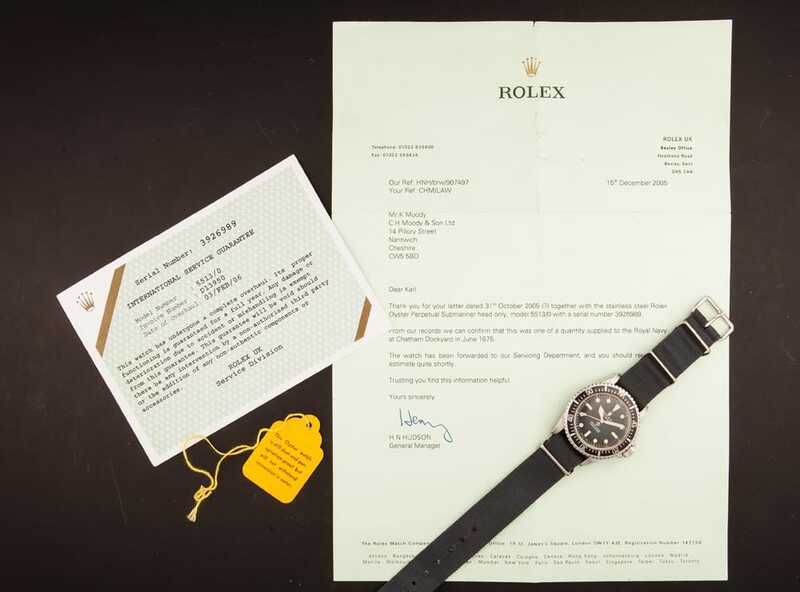 Some brands are affected more than others, with Rolex far and away the hardest hit. 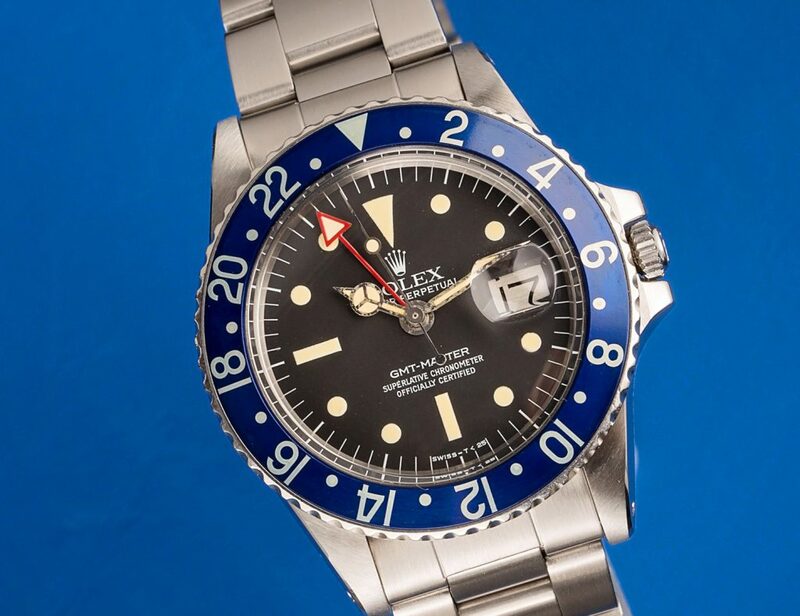 It is estimated there are now more forgeries on the vintage market than the real thing, and the Submariner is the biggest victim. Knowing what to look out for and having complete trust in the seller is the best way to safeguard yourself. The condition of a watch obviously has a huge bearing on its value, but it is not necessarily as simple as the one that looks newest is worth the most. 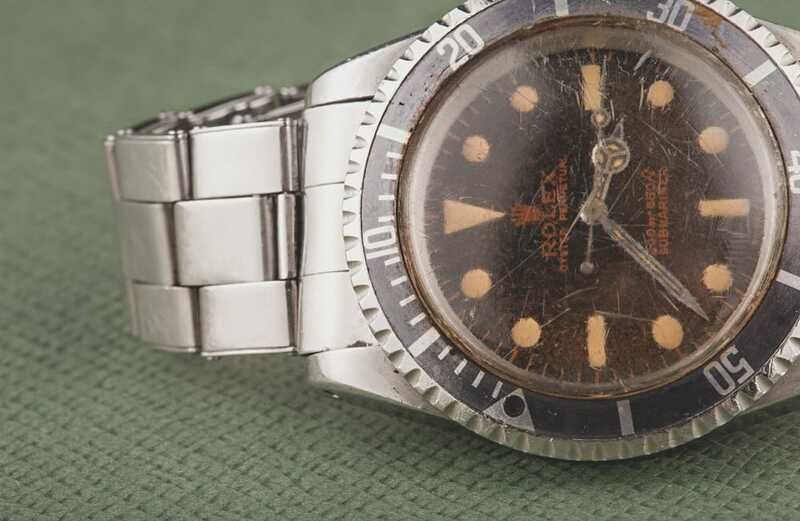 While it is true an overly polished case becomes less desirable, many collectors deliberately seek out pieces with the marks of a full life and are willing to pay a premium for them. Especially with tool watches, a faded bezel or an elegant patina on the dial are indicators of the piece’s story, and more importantly, set that example apart as truly unique; no two vintage models age exactly the same. But once you have established a collection of your own, what is the best way to keep it in the best condition? Commonsense precautions such as storing them away from anything with strong magnetic fields, such as audio speakers or laptops, will stop the internal calibers being adversely affected. Also try to avoid subjecting them to extreme temperature changes. The argument for how often, or even if you should, have your watches serviced rages on. Some stick religiously to the common practice three to five-year schedule regardless. Others prefer to wait until the piece starts losing a noticeable amount of time per day. Still others never have their watches professionally maintained. It is a personal choice of course, but it does seem a bit unreasonable to assume any mechanical timepiece, and particularly a vintage one, is going to carry on working perfectly without showing it at least a little TLC every once in a while. If you wouldn’t expect it from a car, you probably shouldn’t expect it from your watch. Just like selecting where to buy from in the first place, finding the right place to service your watch is also not something to do in a hurry. Again, look for recommendations from within the collecting community and be specific about what you want them to do and not do. A case polish is a standard part of a general service, but too much over the years can change the shape of the case and lugs. If you are happy for the watch to retain its scuffs and scrapes, make sure to let the service center know. While there are plenty of things to look out for, and a few pitfalls along the way for the unwary, a watch collection, above all other things, is fun. It attracts people from all walks of life and from every corner of the globe, and is open to those with any size budget. The attraction for many is the thrill of the hunt. The time spent learning the minutiae of the brand and its different models is deliciously nerdy, followed by the competitive aspect of actually finding the exact piece and securing it. It is a phenomenon that is only growing in popularity, and often turns into a lifetime’s passion. And with more help and advice available than ever before, now is the perfect time to start your watch collection.